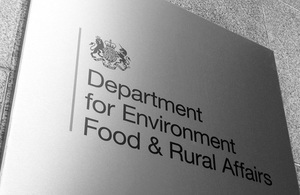 The UK Government is giving £8.5 million to a total of 33 new projects under Defra's Darwin Initiative. Some of the world’s rarest species are going to be better protected following a multi-million pound announcement by Environment Secretary Caroline Spelman today. The UK Government is giving £8.5 million to a total of 33 new projects under Defra’s Darwin Initiative, which has backed wildlife conservation projects in some of the world’s poorest countries for the last two decades. The new projects will provide help to newly discovered species, such as the Burmese snub-nosed monkey, and support under-threat populations of rare animals like the pygmy hippopotamus. At the same time local communities will get help to improve their environment and their livelihoods. Since its launch in 1992, the Darwin Initiative has committed £88 million to 762 projects in over 150 countries. “I am proud of the UK’s ongoing commitment to international conservation, and I’m delighted to announce that the Government is putting more funds into protecting vulnerable species. Over the last 20 years the Darwin Initiative has helped some of the world’s poorest countries protect some of the most important wildlife on the planet. “The money and expertise provided by the UK has funded projects across the globe, from Bolivia to Burma, from helping snow leopards, to aiding the discovery of new species such as the Darwininitium, a land snail found last year and named after the Initiative. Conservation of the newly-discovered Burmese snub-nosed monkey - This new species was discovered in northern Myanmar in 2010. The project aims to help local people monitor the monkeys and develop strategies to reduce dependency on hunting. Building capacity of the next generation of Liberian conservation professionals - Liberia is home to several globally endangered species, including one of the last significant populations of the pygmy hippopotamus. Civil war has destroyed the infrastructure for conservation research and education. This project aims to help them focus and improve the protection of their wildlife. Protecting the critically endangered Bengal Florican - This species of bustard is currently threatened by habitat loss, and just two small populations remain in India and Cambodia. This project aims to help local people understand the habitat requirements of this species and incorporate the needs of Bengal Florican in appropriate management plans. Conservation of Ethiopia’s wild coffee - This project will enable communities to gain secure tenure over their coffee forests and take responsibility for sustainable management of their forests. The Darwin Initiative was created 20 years ago at the Earth Summit in Rio, and it has been responsible for a wide range of successful conservation projects around the globe. The latest round of funding was announced in April 2011, with proposals for new projects invited.